I finally have my dream job! I mean, how many people these days can say they absolutely LOVE their job?? I can probably count on my one hand the number of people that are in my close circle that love the career they are in… and that number gets smaller when being a mom is part of the criteria. In 2016, I was promoted to an Executive position that requires me to travel 75% or more throughout the year. Little did I know that folks would be judging me and my decision to accept this position. Without question, I accepted the position especially since I had been dreaming of this job since I was 22 years old (and I am far from that right now! Huh!) I already traveled about 55% of the year, and my support system was strong, so I had not a doubt in my mind that I would take the job. Well good for you, lady, ‘cause you don’t have to! 1. Keep the village solid… solid as a rock! One thing that I was sure to do when I took this position was make sure my village was solid. My village consists of my grandmother, my husband and my besties. Without these selfless folks, I could not do what I do and be comfortable and confident that my little ladies are in good hands and well taken care of. What kind of mother would I be if I quit dreaming and going for my career desires? What kind of example am I setting for my girls if I stop striving for more… not just for me, but for my family? What kind of mommy would I be if I took any-ole job, hated what I spent most of my day doing, came home miserable and not emotionally available for my family??? Would this be a good example of life? Absolutely not! Putting things into perspective is the key… and verbalize it! 3. Don’t judge me, judge yo’ mama! Listen here! Folks always got some -ish to say. If it ain’t me and my work/home life, it’s going to be something else. For all the judgy folks I got some crystals, sage and some positive come-backs for that a$$. If someone has some -ish to say and/or judgement that they THINK will affect me… they have another thing coming. I keep these conversations quick and most importantly positive. They won’t stand a chance in the conversation and will feel like a total a$$ after speaking on my life. Keeping in touch while traveling is key. My little has an iPad, and she uses it for daily homework. When she was really little, I would bring a book or 2 and we would have story time (even if it was much earlier than bedtime). Now that she is older, it is just a good way for us to connect throughout the day. The most memorable FaceTime experience that she had was with the founder of the company I work for, Madame Laura Mercier! She was so excited to be able to see her and talk to her via Facetime, and still talks about it to this day! 5. Stack yo coins… like fo realz! I am not for spending too much money where I don’t have to. I am a bit of a penny pincher. But one thing that I certainly do is buy my littlest lady a “trinket” on every trip. For the new cities that are on my schedule, I buy her a mini snow globe. This is so much fun because we look up the city on the map and talk about what they are known for (it makes it educational and fun). If it is a city I visit frequently, like NYC, I bring her home something inexpensive yet cool that she can get excited about. She has been into keychains to add to her backpack lately, so that makes it easy. She has quite the collection of both snow globes and key chains now, and it is a small gesture to let her know I was thinking about her in my travels. 6. AND stack yo points, too! Just as I am stacking my coins for the little “trinkets”, I am remembering all the points I am stacking with Corporate American Express, hotels and airlines, too! My husband and I traveled to Thailand for our honeymoon and to Jamaica for a last-minute trip using mostly points and will be taking the kids on a nice trip complements of our crazy work travel… don’t mind if I do! Thank you very much! All in all, being a mother is not the easiest thing in the world. Staying positive and figuring out what works for you is the major key! 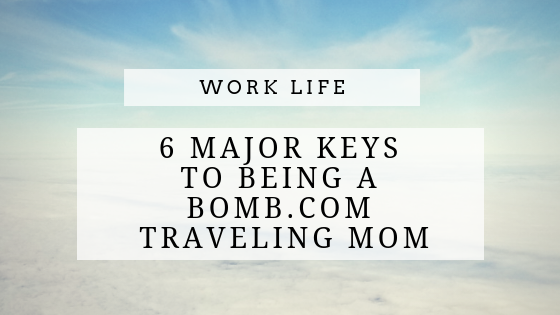 How do you keep things together as a working mom? Tell me all about it in the comments!